October is National Breast Cancer Awareness Month, and many companies partner with Susan G. Komen to help raise money and awareness for breast cancer. Feit Electric Partners is one of those companies who joined in the fight with Susan G. Komen by creating the A19/TPK/LED/SGK Susan G. Komen pink light bulb. The company has also pledged to donate $50,000 to Susan G. Komen this year, regardless of sales of the bulb. 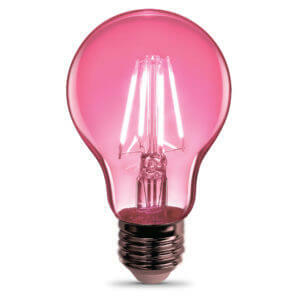 The Susan G. Komen bulb has a clear outter glass with a filament that glows pink when turned on. The bulb gives off a beautifully colored light that is dimmable. It uses only 4.5 watts of electricity making it energy efficient and friendly to the environment. The Komen bulb is sold exclusively at Home Depot. It is designed for indoor and outdoor use.